Victoria Lucas’ film After presents us with a series of sweeping and beautifully composed images of ambiguous spaces and abstracted details; walls, halls and nooks meet open staircases and elevated walkways, all subtitled through the familiar language of signwriting. Merging gradually, these points interconnect to forma mid-twentieth century indoor market building. To the knowing viewer, recognising signifiers or informed in advance, we are looking at Castle Market, an architectural landmark, built in the 1960s,both loved and maligned in the city of Sheffield. An encounter with a building long abandoned through war, disaster or an unknown historical event seems to create a rupture of time and place, in which something unknowable is brought so closely within the reach of our imagination. This sensation is momentarily called to mind in Lucas’ film by the eerie beauty of the market’s yellowed windows, flaking paint, dusty spikes and unused gates, yet the film’s unwinding of the site reveals a more complex and yet subtle slippage of the present. A circulation of lives undulate alongside waves of economic and material change; fragments of the past, present and future collide around us in the styles and ideologies inherent architecture, interiors, products and facilities; the spaces of our memories and imaginations provide continual interruptions. If the urban encounter isa kind of harmonious cacophony, the market seems to condense it under one roof. After extends this shifting consciousness into film, bringing about something between scrutiny and reverie, rooted and yet drifting. As the gloriously naff brushes against the respected and classic, the tasteless and outdated against the quaint and archaic, markets exhibit not only a moment in time but an interwoven constellation of eras and ideas. Reflective of this, Lucas’ film presents within Castle Market a flow of materials and form, from composite concrete, polished tropical hardwood and iron work with an elegant air to patterned tiles and leather benches that we might see in a retro themed restaurant or vintage emporium, all peppered with colourful digital signs and other features that have not yet gained a retrospective appeal. With its candy-striped tarpaulin, gingham plastic tablecloths, hand-written luminous labels, meat hooks and booths all housed within its distinctive architecture, the building appears both anonymous and intensely specific, uniquely of one place and yet reminiscent of so many others, from markets across the country and further afield to seaside promenades and even Victorian arcades. Many markets carry a sense of both precarity and hardiness. As ubiquitous hubs with ties to the beginnings of urban development, they might be simultaneously inscribed with notions of local identity, rejected for their crudeness, adaptive to trends, blanketed in nostalgia or novelty and respected for their ethical credentials and enabling of thrift. The marketplace also takes on other forms in our minds, less tangible and sited but prevalent within much of our daily activity. In comparison to this invisible, global market, the physical marketplace seems to remain so constant throughout decades of change, the contemporary seeping into its walls only in glimmers as organic foods and smartphone accessories puncture an almost pre-internet environment. 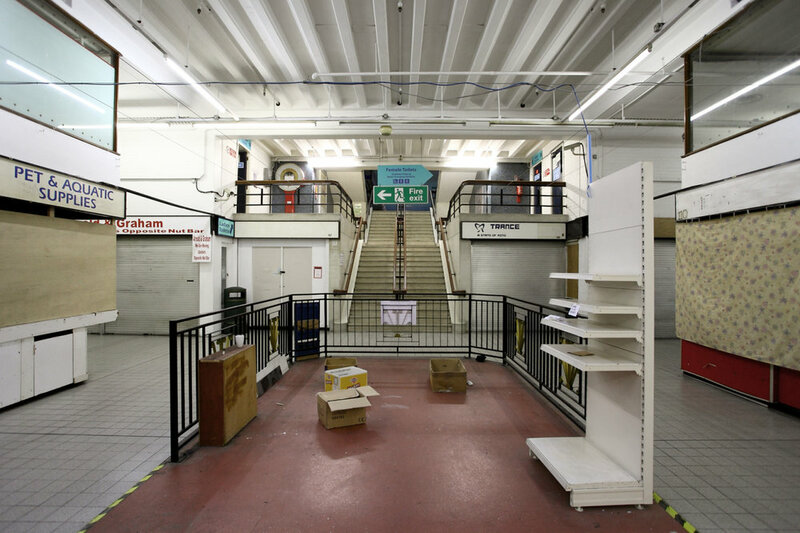 Shot after the final close of its doors, After amplifies the ambiguity of Castle Market’s place in time. Certain shelves are fully stocked while refrigeration units, covered over neatly as if awaiting the next day of trade, provide the backdrop to the building’s own autopsy. Its sparse interior invites us to project within it multifarious wares with textures and smells so visceral. Raw meat, fresh fish, dog biscuits, fruit, cleaning agents, endless threads, ribbons, sheets of lace and a spectrum of fabrics in rows of rolls, bread rolls and sticky buns, fried eggs and logo t-shirts, lycra dresses and cotton nighties, local brands and goods of ambiguous provenance all lie just beyond perception. The building appears expectant, as though temporarily vacated, the noise it contained still resonating through its empty corridors. Un-soundtracked and deeply sonorous in their silence, these echo chambers are only pierced by the sudden voice of an unnamed singer who appears, unintroduced, as if residing within the building’s cold walls for as long as she can. As if to acknowledge the impossibility of portraying the knotted lives and ambience that surrounded and filled the market, the film is devoid entirely of human presence until this point, at which the gray haired woman sits, neck scarf draped and palms resting in her lap. Her rendition of Harry Creamer’s 1946 song After You’ve Gone pierces through from another time long past, a time that pre-dates the market itself. Though she appears as part of the building, we are aware of the camera, of ourselves looking in, and of the staging. The building becomes a theatre, serenaded by its only remaining player through whom it gains a voice and sends a warning, and whom at the same time it envelops, swallows within a vast container of white and glass. It’s unclear who the lyrics are addressing – the building will be missed, who is to blame? The answer is of course not a simple one and lies within a wider picture, a web of factors that Lucas’ work evokes without trying to unpick. Resisting the romantic, sentimental, cold or analytical, Lucas’ project presents neither a paradise lost or a relic examined. The film is an insertion into the story of Castle Market, a suggestion of uncertainty and inevitability, an exploration of context and form. Bringing building into image into film into book, the project is an impossible archive; an honest portrayal and unreliable document in which a place is lost, bound and re-lived. Those lamenting the loss of the site are left with familiar problems surrounding the preservation of a colourful memory without its encasement in a vitrine. After makes a proposition that evokesthe significance of the place yet rather than communicatingits history, suggests it within a wider web of narratives and one in that we don’t have to have experienced the market to be drawn within. Charlotte Morgan is an artist based in Sheffield, UK, co-founder of publishing platform COPY and Curator/Manager at Bloc Projects, an artist-led project space and member of the Art Sheffield Consortium. Written for the Castle Market Artists Book, developed by Victoria Lucas as part of a 6-week art residency with Art Sheffield 2014.